Italian lifestyle brand Etro is exploring the world of interior design with a collaboration with Milan-based shelter publication, Cabana. Although based in Milan, the English-language text covers the interior design space and is directed by editor Martina Mondadori. 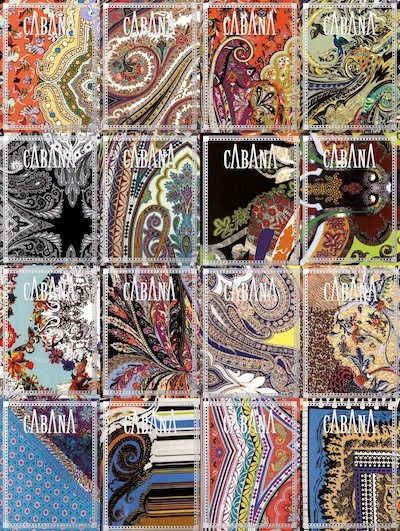 To celebrate the magazine’s third issue, Etro has outfitted 20 different edits of Cabana. Etro’s joint project with Cabana will be presented at the Mi Art 2015 show April 10-12. The art show encourages the creation and celebration of contemporary and modern artworks throughout the year, not just during the weeknd of the fair. 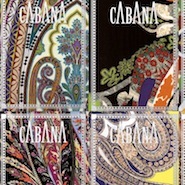 During the art fair, Cabana will have a Pop Art store showing off the Etro covers. Also, Etro’s Milan boutique in Via Montenapoleone will have the covers displayed in the windows. Similarly in 2014, Italian apparel label Emilio Pucci built momentum for “The Glamour of Italian Fashion” exhibit at London’s Victoria & Albert Museum by working with Hearst’s Harper’s Bazaar’s United Kingdom imprint to release four limited-edition covers. The four Emilio Pucci covers graced the April issue of Harper’s Bazaar and helped the London fashion scene fete the opening of the museum exhibit on April 5, 2014. Harper’s Bazaar has an active partnership with the Victoria & Albert Museum and likely increased foot traffic to the exhibit by way of its readership (see story).